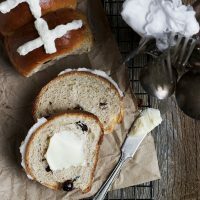 These delicious Brown Butter and Dried Cherry Hot Cross Buns are a traditional Easter treat with an untraditional flavour update. Great eaten out of hand with butter, or slice and toast. Every year for the past few years, I have been trying a new hot cross bun flavour (last year it was Dried Blueberry and Lemon Hot Cross Buns). I use the same base recipe, pretty much, just the flavours are different. This is a small-batch recipe, making only 6 buns. 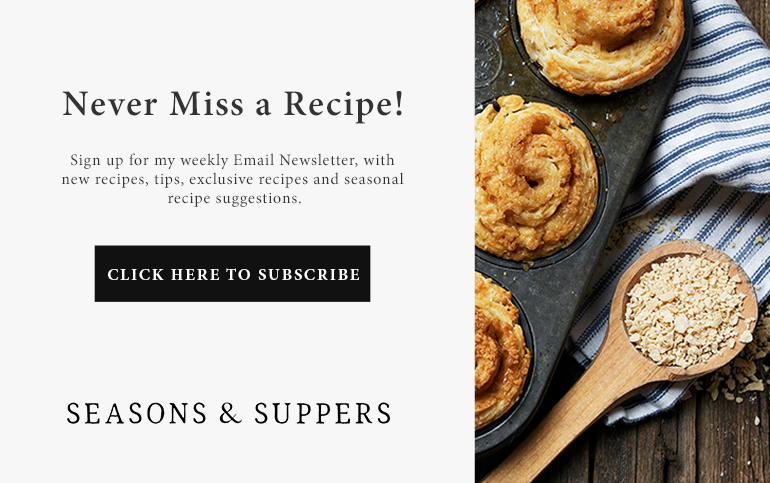 You can easily double the recipe if you’d like more. These also freeze well, so you can make ahead and enjoy at Easter. You can use 2% milk, in place of the whole milk, if you don’t have any. 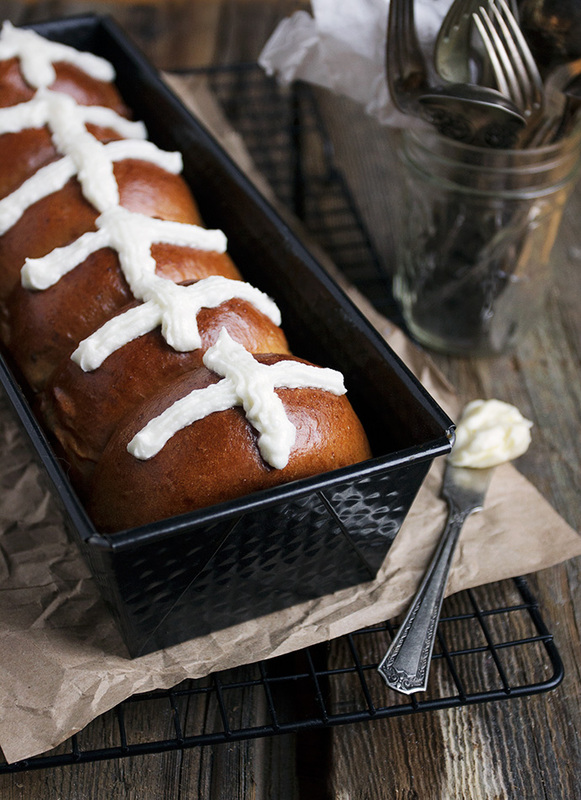 I love the icing on hot cross buns, so I always ice mine. They are perfect for eating out of hand with butter, but if you decide you want to toast them (and they are lovely that way, too), simply remove (and eat! :) the icing before toasting. Any exposed dried fruit has a tendency to burn and become bitter during baking. When you form your balls, be sure to push any fruit that is poking out through the dough down in to the dough, to avoid that. 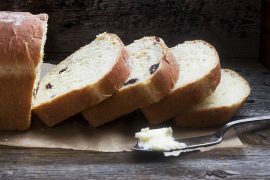 Delicious brown butter flavoured hot cross buns with dried cherries. You could also substitute dried cranberries, if you like. These freeze well, so can easily be made ahead. If you have a scale, I suggest using the weight measurements. Brown butter: In a small saucepan, heat butter over medium heat and allow to boil until you start to smell a nutty fragrance and mixture starts to change to a golden brown colour. 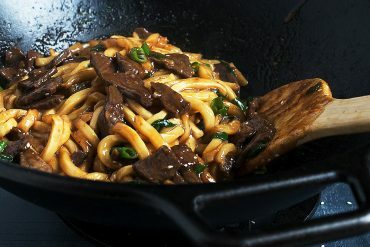 Swirl pan regularly as it heats so you can see the colour change underneath the bubbles and watch closely, as it can easily burn. You are getting close when you have lots of very tiny bubbles. Once butter has browned, remove from heat and immediately pour into a small bowl. Allow to stand/cool until lukewarm or room temperature before adding to dough. You will notice a pool of dark brown sediment at the bottom after it has sat for a bit. That is the milk solids that brown more quickly. 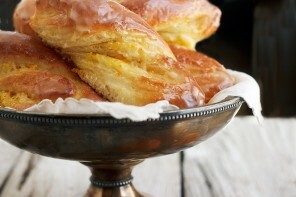 They can often taste bitter, so either remove with a spoon before adding butter to dough or pour butter carefully in to dough bowl, without allowing the dark sediment in to the dough. (You can hold it back with a spoon as you pour). Heat your milk: In a small saucepan or in the microwave until steaming with small bubbles around the edges. Set aside to cool to lukewarm. In a large bowl or the bowl of your stand mixer fitted with the paddle attachment, add the sugar, flour, salt, cinnamon, nutmeg and cooled brown butter to bowl. Still using the paddle attachment, work the butter in to the flour to combine. Switch to kneading hook with stand mixer. Add milk/egg/yeast mixture to bowl. Knead until dough is smooth and elastic, adding a bit more flour if necessary. Add dried cherries and knead until incorporated. Remove dough to a greased bowl and cover with plastic wrap. Allow to rise until doubled, 60-90 minutes. Remove dough to a floured surface and divide in to 6 equal portions. 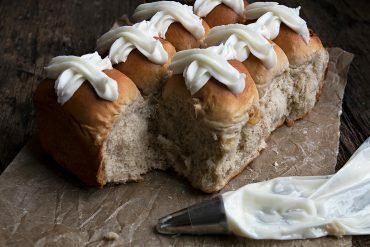 Form each portion in to a ball and place in a greased or parchment lined 9×5-inch loaf pan (3 rows of 3 buns or alternately, if you have a long loaf pan, 6 buns in a row). Cover with a tea towel and allow to rise until almost doubled and puffy – 30-45 minutes. 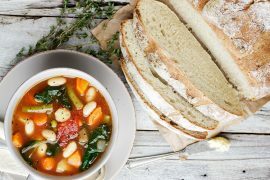 I just made tonight for this recipe first time with using my bread machine . Browned butter first and during Machine mix dough , I just pour browned butter little by little. End up very nice buns !! I don’t have ling loaf pan, so I was using 8×8 pan and baking. I’m sure I’m gonna make again !! 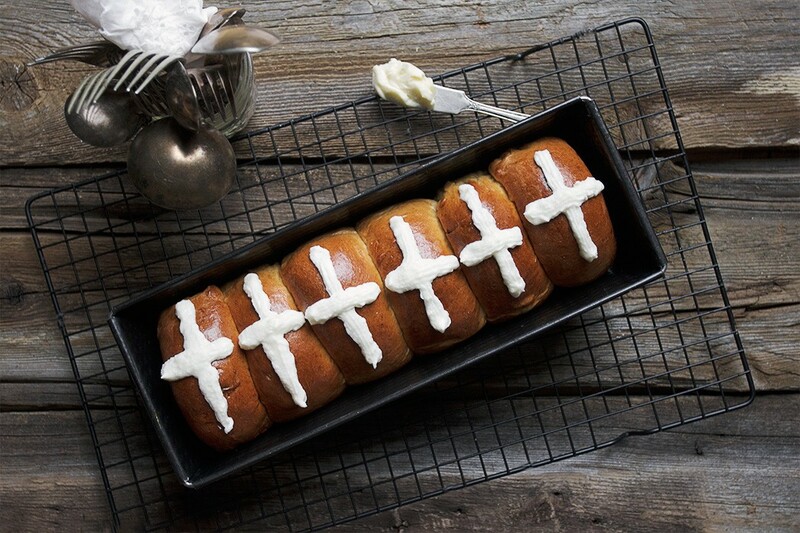 Simply stunning and I love a little bit of icing instead of just white batter for the crosses, seems so much more luxurious and Easter worthy! Wow, best looking buns ever! Any chance I can swing by and pick some up for next weekend? lol. I’m so embarrassed that I buy store bought at Easter. I think I could con my sister in law to help me make these! I’ve never actually had hot cross buns… eek! I’m going to have to remedy that by trying this recipe! I think you must :) They really are very delicious, as well as festive! What perfect hot cross buns, I love the brown butter flavor! 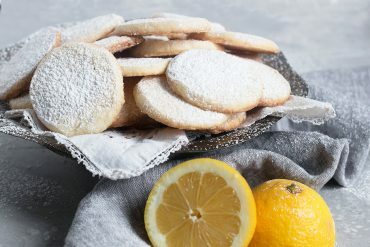 What a delicious and fun way to celebrate the season! I love the new flavor combination Jennifer! Thanks Chris. It’s always fun to think up new ones to try! Your kitchen must smell amazing with these coming out of the oven, love the browned butter flavor in them! I have a hot cross bun recipe but never thought of adding browned butter to it. What a great idea. Will be trying your recipe. My husband would toast these in a split second! I love the whole experience of the soft middle with lots of fruit and the sweet bite of icing. These sound wonderful and they are beautiful too. Love that pan! Thanks Tricia. I love long loaf pans! 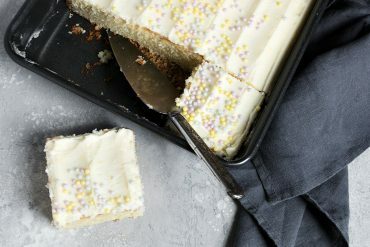 I love the idea of splitting them and toasting them…then I’d slather on that wonderful icing! These hot cross buns look wonderful Jennifer! Growing up my mom and gram always made sure we had these during the Easter season. They bring back such great memories! Thanks for making my day! 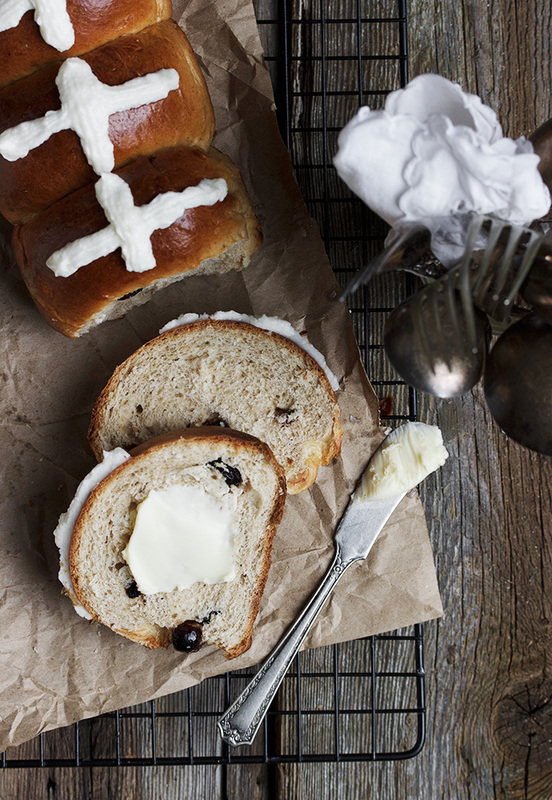 Adding browned butter to your yearly hot cross bun experiments sounds like the perfect plan! I’ve never ever tried a hot crossed bun, let alone made one!! I feel soooo out of it. This needs to change!! Yes, you must change that, Katrina :) They are delicious, lightly sweetened and spiced buns. 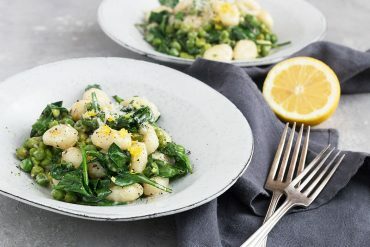 Great with just butter or lovely toasted, too.